The Leeds Assessment Frameworks are intended to assist Health Visitors structure their visits to families and new parents. The Frameworks have been developed to support a shift in the approach from an expert model to a behaviour change model that is a basis for improving Health Visitor’s assessment of need, by getting to know families better, by identifying their decision making skills, recognising their aspirations and achievements, remaining positive, listening to parents experiences and assessing risk and resilience. The pack contains a user-guide video on CD, template Framework forms and a handbook to support staff in carrying out visits using the Frameworks. This product has been developed by Health Visitors with many years’ experience in working with families on a day to day basis. It is fully embedded within Leeds Community Healthcare NHS Trust and has received positive feedback from both practitioners and families. 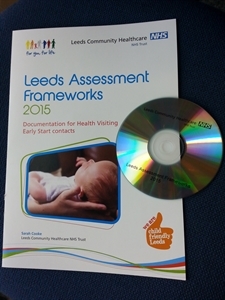 The “Leeds Assessment Frameworks 2015: Documentation for Health Visiting Early Start Contacts” pack (containing booklet and CD) is intended for use by a single (trainee) Health Visitor. The owner is free to print off copies of the Frameworks for use with families.